Interview with Lt. Col. Lee W. Chatfield, C.O. Capt. John W. McIndoe and S/Sgt. L. F. Cuifo, operations Sgt. On the 13th of September, the 1st bn was constituted into a special task force with the mission of cleaning out Camp d’ Elsenborn. In addition to the 1st bn, Chatfield had the 60th FA (one company), 1 company of tanks of the 746th, and 1 platoon of TD, 899th, and two platoons of the 9th Recn Company. The command of the task force lay with General Buchanan, assistant commander of the division, but during the operation the various units were attached to Chatfield. At 1030, Chatfield contacted General Buchanan at 808088, on the crossroad about 5 km north of Malmedy. B. Company with the armor was sent north along the main road to the RJ 825137, where the enemy was known to hold a road block. The company received fire as it approached the road junction, but the enemy fled when the tanks drew up. The other two companies set out on secondary roads in an eastern direction, through Longfaye, Ovifat to Sourbrodt, where it drew its first enemy fire. (Chatfield temporary had G Company, 60th Infantry, consisting of 60 men and a captain at this time. The company did not remain with the task force). Just east of Sourbrodt, the column hit sniper fire, but it proved to be no obstacle to the advance. About two kilometers farther down the road, however, the column ran into more serious enemy opposition. The enemy had at least one mortar. (80mm), several machine guns, and other small arms. There were perhaps 50 men. Chatfield found it necessary to deploy Bono Company. The tanks were brought up to the ridge facing the enemy, which was deployed at the western end of the woods near 880087. It was now about 1500, and as Chatfield deployed his armor before the attack, the column received some fire from the right flank. The TDs were therefore used to fire to the south, while artillery and mortars were employed against the enemy position to the east. The battalion attacked about 1600, and upon the advance the enemy scattered. A Company led in the effort, with the tanks mixed in with the infantry. The column then moved without difficulty into Camp d’ Elsenborn (902085) for the night. 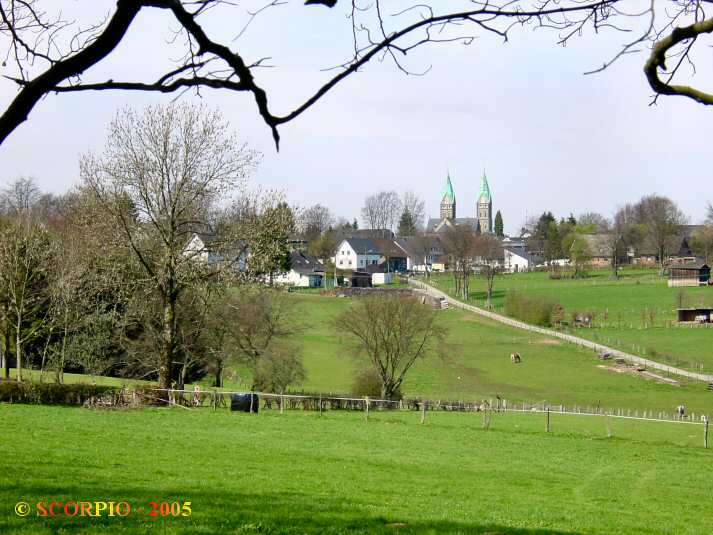 During this period the 4th Cavalry Group was fighting for the town of Elsenborn, some two kilometers southwest of the Camp. In the morning Chatfield was given the mission of attacking Alzen, Hofen, and Monschau. It was evident that the most difficult terrain would be faced if the attack was launched directly northeast towards the objective. He therefore planned to a point just south of the frontier (929118), and then use the fire breaks to cut east in order to attack Alzen from the southeast. This plan, however, depended upon dry weather, and during the night the rain fell heavily and the ground proved to wet to hold the armor. In view of the weather, therefore, the alternate route had to be adopted. The battalion planned to move northeast to the town of Kalterherberg (927147), and then jump off to the east to attack Alzen. Since the fighting was still going on in Elsenborn (925075) and Chatfield knew that enemy would be present on his right flank as he turned to go north, he sent two platoons of the Ten Company out to screen his right flank. One platoon was sent directly up the road northeast to the vicinity of 928105, while the other platoon was instructed to go to Hill 585 (926079). The first platoon managed to get through, but the second platoon got fire at 911091, and was unable find its way to Hill 585. It was ordered to go north east up the road and try from the north, but it had no success in this action either. Since fire began to come on the right rear of the column when it turned north, Chatfield ordered A Company to seize Hill 585. A Company and the TD platoon were instructed to move, and they got mortar and small arms fire, from the road between Camp d' Elsenborn and the town of Elsenborn. The Mortar platoon fired on this area, and along with the TDs silenced the enemy opposition. 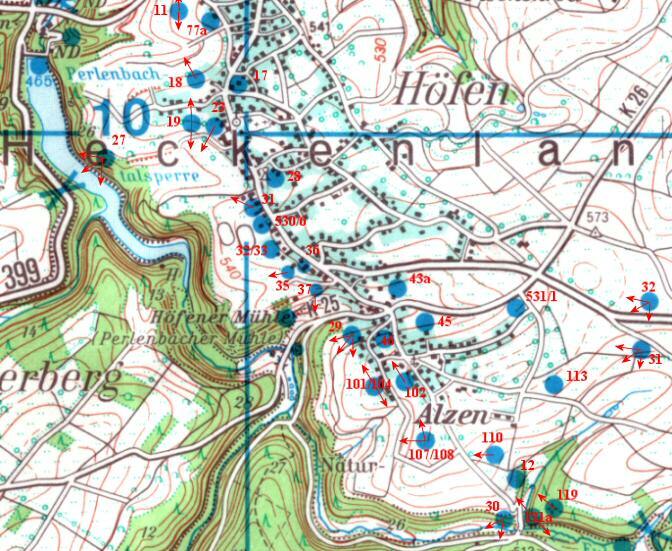 A Company pulled out of its position at the tail of the column, and moved without serious difficulty right on the first road crossing northeast of Camp d' Elsenborn at 911091, and went directly east to occupy the ridge at 585. It set up a defensive position facing towards the southeast, and thus protected the flank of the battalion as it continued on its march north towards the German frontier. A Company AT guns with it which fortified its position. The column moved north along the road towards Kalterherberg. Approximately 50 yards short of the frontier the enemy had blown a large crater just as the battalion came into view. 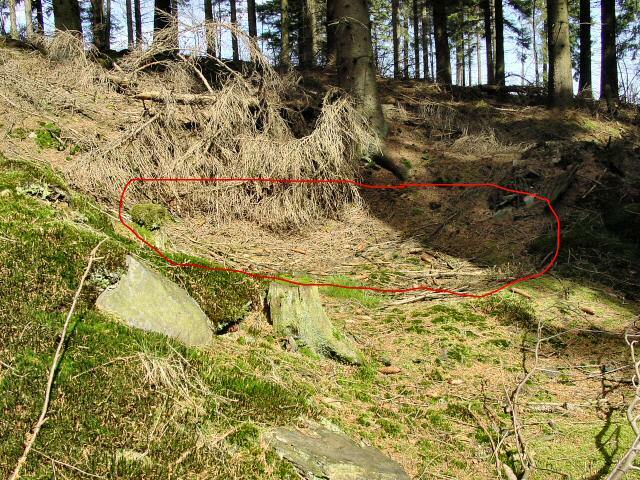 Throughout the woods south of this point, the column had been subject to harassing sniper and small arms fire. At the crater, which was not seriously defended by enemy fire, Chatfield sent the leading elements right on the trail into the woods, and then the tanks went parallel to the main road through the woods to break a trail for the rest of the vehicles. The trail proved too bogey, however, for the vehicles to move through, and only a few got back to the road by this method. Other vehicles tried to use a small trail just west of the highway, with similar ill success. However, enough of the column got through to enable Chatfield to continue the advance by 1300 (the crater caused approximately 2 hrs delay). In passing this obstacle, Chatfield had no engineers to help him. Instead the Anti-Tank Platoon was called up, which first tested the crater for mines and then prepared to fill it up. 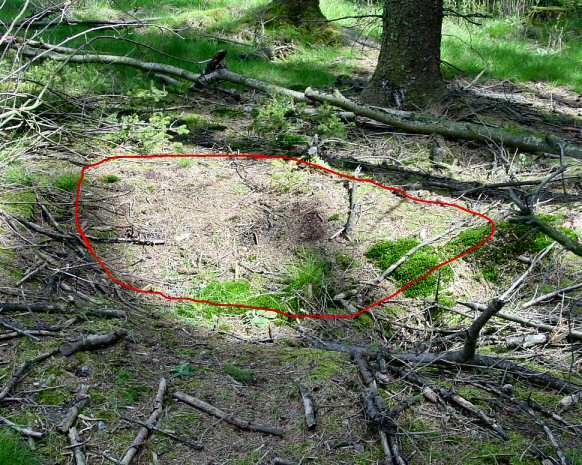 The crater was too large to be filled quickly, but a by-pass was built right at the edge of the road. (Chatfield had 4 tanks and 4 TDs with the task force, but at this time the TDs were back with A Company in the defensive position). From the point at which Chatfield met General Buchanan the previous day, the infantry had been on foot. When in a column march such as this, therefore, the tanks and infantry were made mutually supporting. At the lead was a platoon of infantry, about 100 to 400 yards ahead of the next elements, depending upon the terrain. Next came the rest of the leading company, in column of twos on each side of the road. Interspersed along with this company, were the tanks. The tank commander was thus in a position to support the leading platoon with fire soon after contact was made with enemy. The column had received some enemy artillery fire as it moved north towards the border. About 1500 yards to the right, Chatfield observed a tower, which might well serve as an observation point. He called for artillery fire on the tower and then on the hill beyond (9411), which seemed to be effective in silencing the enemy. At 1300, having, cross the German frontier, the column cleared the woods and entered open country just south of Kalterherberg. There it received small arms, and machine gun fire from the enemy in position south of the town. Chatfield deployed C Company, and at the same time he called up A Company and the platoon of TDs from their position at the rear defensive position area. C Company attacked north toward the town, but as it approached the buildings it encountered an iron gate. which would not permit the armor to go through. Thereupon, the column swung right, and hit another road leading into the town. Against, it encountered an iron gate, but this time the vehicles went through the yards of the houses and continued without serious difficulty to the road junction in the southern part, (930135) Time: 1345. As the tanks approached the town they fired into the buildings and against enemy infantry. There were approximately 50 enemy captured who were attempting to man position near the iron gates. They had some machine guns and small arms. Chatfield left C Company at this position for defensive action, since up to this time it had been leading the column and was the first to arrive in the town. The rest of the battalion moved up, including C Company, which arrived from the south. One platoon moved two hundred yards up the road towards the center of town to man a road block against possible enemy activity from the north, while the rest of the company fanned out to the southeast, since Chatfield "had not a thing on the flank except Germans". At about 1700, Chatfield had A and B Company, on the right and left respectively, moving northeast in the direction of Alzen (957153). About 500 yards from the town B Company hit enemy, who fired with machine guns. It took some little time before the company was deployed and had its own machine guns in operation. When this had been accomplished, under Chatfield's direct supervision the enemy put up a white flag. The firing ceased in view of the surrender, but the enemy took advantage of the flag to withdraw. At 1700 B Company attacked from its position (vic. 937137)) northeast through the woods in the direction of Alzen. A Company was echeloned slightly to the rear and some two hundred yards to the right. By 1800 B Company was able to reach the brow of the hill facing the town of Alzen, (9515) A Company reached the nose of the next hill to the right (952148). In the meantime, Chatfield had taken C Company from its defensive position and brought it in on the left flank of B Company, in order to protect the flank of the position and the left rear facing Kalterherberg. It was dark before C Company was able to dig in. Even though it was already late in the afternoon, Chatfield decided to make a probing attack in the direction of Alzen, in order to determine the enemy strength and determination. The terrain facing B and A companies, however, was discouraging as far as attack was concerned. The slope of the hill immediate to their front was steep, and the valley they overlooked was marshy, on the other side of the stream, the hill rose steeply, while on both slopes there were woods. At 1830, in the face of enemy small arms fire, the two companies attack, crossing the valley, and began to work up the slope beyond. The enemy had excellent fields of fire from PBs at 955150 and 958150, and only one group of B Company actually made any progress up the hill. 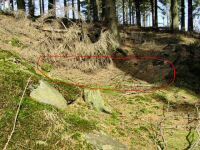 The enemy likewise was dug in along the slope, and it was from this position that the attacking companies got more of the fire. Chatfield knew from this enemy action that the town of Alzen could not be taken that night, and he withdrew the two companies to their original position on the brow of the hills. (Next morning however, it was found out that the attack had driven Chatfield had the two reconnaissance platoons and the AT platoon man the pillboxes south of Kalterherberg.